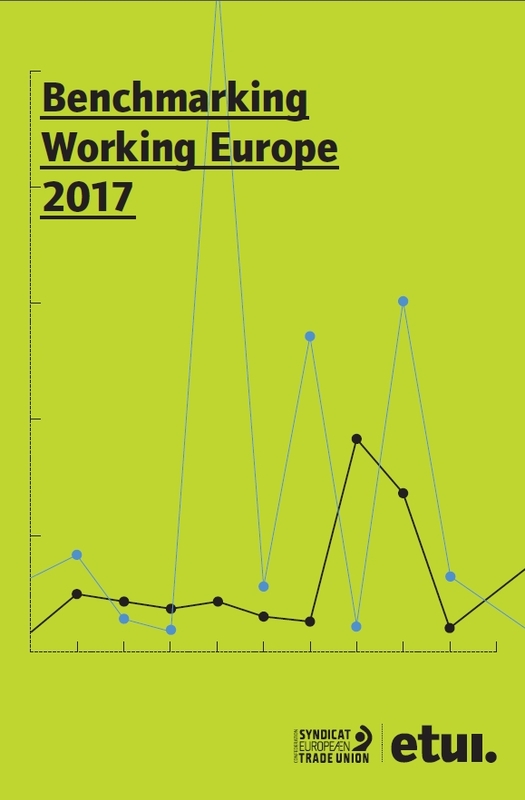 Benchmarking working Europe is an annual publication, first published in 2001, which monitors the state of labour and social affairs in the European Union using a multi-dimensional set of indicators. It aims at establishing what progress, or lack thereof, has taken place in selected areas of importance to the trade unions and of significance for a social Europe. The chosen focus for the 2017 edition of Benchmarking working Europe is ‘overcoming cleavages across the EU?’. Current political, economic and social divergences across the continent are preventing the European Union from successfully addressing the challenges facing the economy, environment, labour market and social protection systems, and therefore from forming a viable policy basis for Europe’s future. - Can stagnating EU Social Dialogue be successfully relaunched? - Will any such a relaunch of the EU Social Dialgoue be the 'last chance'? - Are workers' rights back on the social policy agenda? Are there any legislative initiatives relevant for workers' rights? - Does the European Court of Justice (Court of Justice of the European Union) bring equality to 'atypical' workers? - How rich is the EU palette of information and consultation rights and does it set a benchmark for workers' participation? - How is company-level workers' representation essential for all parties? - Why don't workers in small companies have representation in works councils across the EU? - European Participation Index updated: severe discrepancies across the EU - why? - What rights are available to workers in restructuring and how do they handle company change? - Celebrating 20 years of European Works Councils legislation: evaluating the practice and recent analyses of their operation on the eve of a possible review/recast of the EU directive on EWCs. - EWCs and Brexit: what will the divorce look like? - How does Board-level employee representation (BLER) become European? - Do all Europeans have similar views on BLER and are these converging? For the rest of the publication please refer to the ETUI website, where the entire publication and subsidiary materials can be downloaded for free.